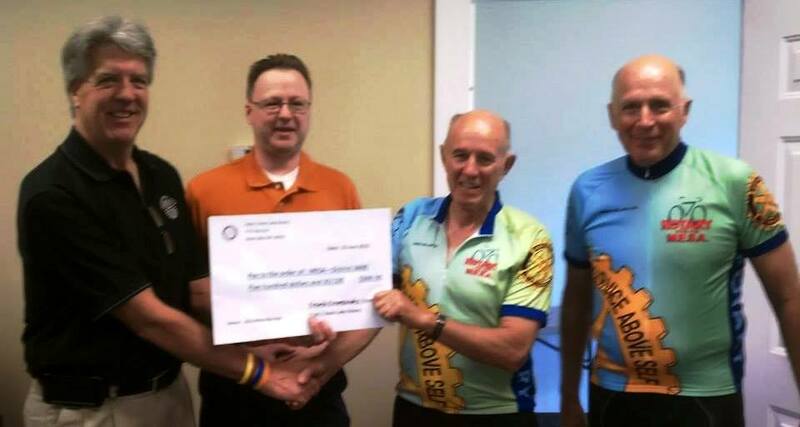 On Thursday June 25, 2015, fifteen Rotary members and Sponsors began the Avon Lake to Amherst leg of the fifteen city bicycle tour to raise funds for MESA – Medical Equipment Supplies Abroad. Every year the organization raises greatly needed operating funds through an Annual Bike and Motorcycle Ride, although the tour does not often go through Avon Lake, Sheffield Lake and Avon. Courtesy of Sprenger Healthcare Systems, the riders will enjoy dinner on Wednesday, then breakfast on Thursday before heading to Amherst. MESA was formed in 1981 by the Avon Avon Lake Rotary and all the other Rotary clubs of Northwest Ohio. Due to the support of local communities and medical groups, MESA has the resources to collect, sort, identify, store and ship millions of dollars of still usable medical supplies and equipment. This includes used but usable dialysis machines, surgical tables, x-ray machines, crutches, walkers, and more. Each year MESA makes or facilitates numerous shipments or projects to countries all over the world, especially in Central America. Generally the projects relate to urgent healthcare needs. Anyone wishing to donate funds or used equipment should contact Rotarian Allen Porter at 440-476-1531 or go online at www.RotaryMESA.org.